Roller Shutter Side Seal Black is NOW ALSO AVAILABLE in WHITE! Formseal are delighted to add the Roller Shutter Side Seal to its ‘Rollerseal’ standard product range – available FROM STOCK in WHITE – as demand has increased for this popular product. 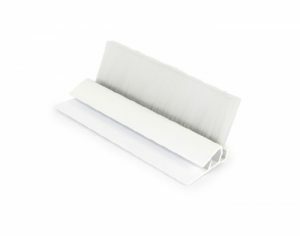 This easy to clip on brush seal is perfect for roller shutter and door guide channels and is simple to fit! Prevents draughts and door vibration.